I really can’t believe I’ve already made it through week four of The Bread Baker’s Apprentice Challenge! The fourth bread we tackled from the book is brioche. Yes, buttery and delicious brioche. Although I love to eat the stuff, I had never before baked brioche at home so I was really looking forward to this one! Peter Reinhart gives us a choice between three versions of a basic brioche: Rich Man’s Brioche, Middle Class Brioche, and Poor Man’s Brioche. Since butter is the most expensive ingredient in this bread, it stands to reason that the Rich Man’s Brioche contains the most amount of butter (a whopping 16 ounces). The Middle Class Brioche calls for a more moderate amount of butter, while the Poor Man’s Brioche almost seems healthy after reading the butter content of the other two. My original plan was to try at least two different ‘classes’ of the brioche so that I could compare the results. But it seems like time has just not been on my side when it comes to baking lately. And since I’m the only one home these days, I really couldn’t justify baking that much brioche in one week. It was really hard to decide which one to try, but at the last minute I said what the hell and jumped in with a full pound of unsalted European-style butter. And I created the richest, butteriest brioche I’ve ever tasted. Like the other breads we’ve made so far, the Rich Man’s Brioche starts with a sponge. 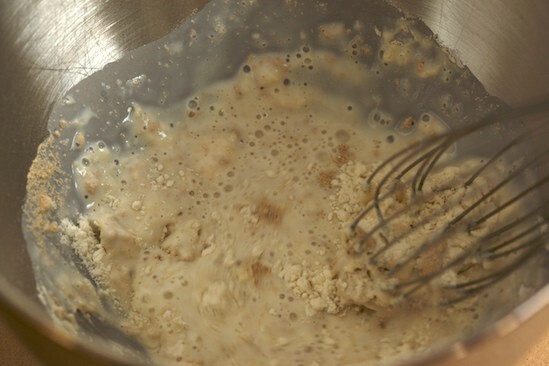 I whisked together a bit of flour, yeast, and some lukewarm milk. After it’s mixed together, the sponge was given some time to ferment. This sponge grew quickly, and had doubled in about half an hour. Next, I added five slightly beaten eggs. 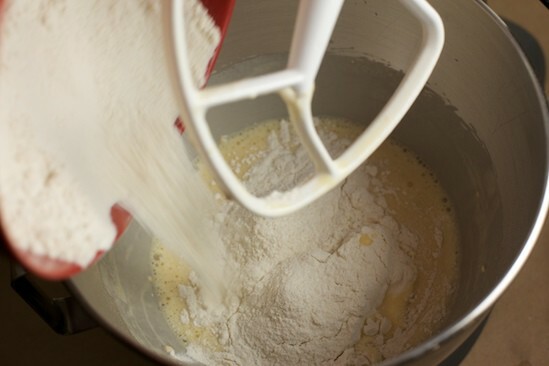 The eggs needed to be blended into the sponge before adding the extra flour. Next I added the mixture of flour, sugar and salt. And once again, let the mixer do it’s work. I must say it was nice to have a week off from kneading after those bagels last week! Once the flour was completely incorporated, I was left with an extremely sticky dough! I followed Mr. Reinhart’s instructions and let the dough rest for five minutes to develop the gluten before adding the fat. And then I started adding the butter. 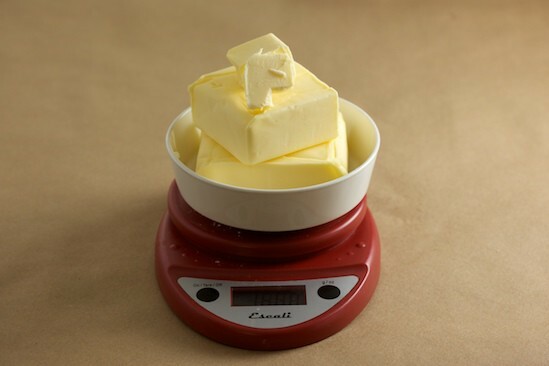 The butter needs to be at room temperature so that it’s easy to blend in. Even though my butter had been sitting out for hours, it still wasn’t as soft as I would have liked. Next time I’ll leave it out overnight. 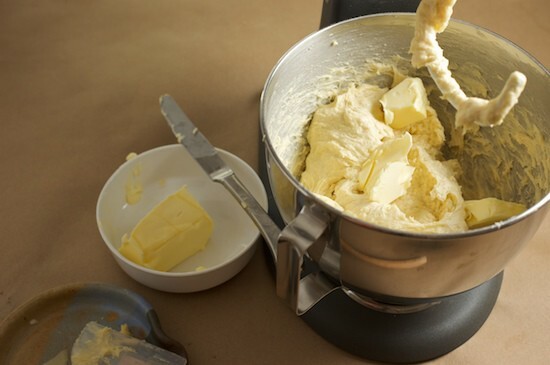 As I continued adding butter and mixing, I found that I had to switch to the dough hook on my Kitchen Aid mixer after the dough repeatedly climbed the paddle while mixing. 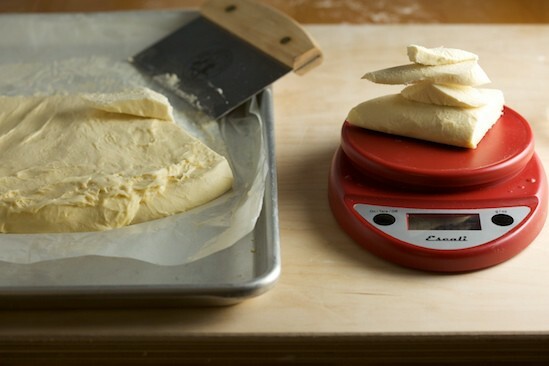 It was harder to mix the butter in while using the dough hook, but still much easier than trying to do it all by hand! 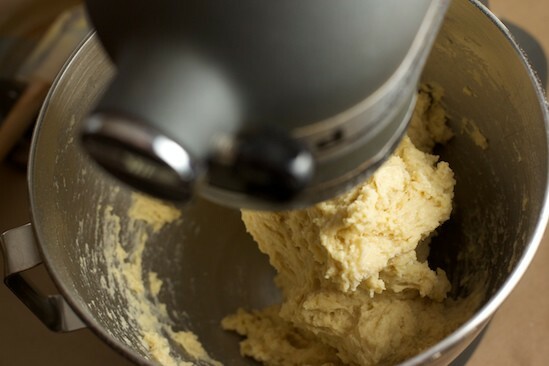 After the butter was all incorporated, I continued kneading the dough with the dough hook until it was smooth and satiny. 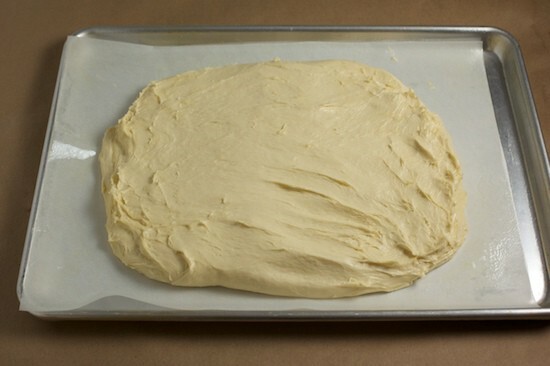 I’ve never worked with a dough like this…it was gorgeous! Kind of looks like frosting, doesn’t it? And yes, I tasted it (didn’t taste like frosing). 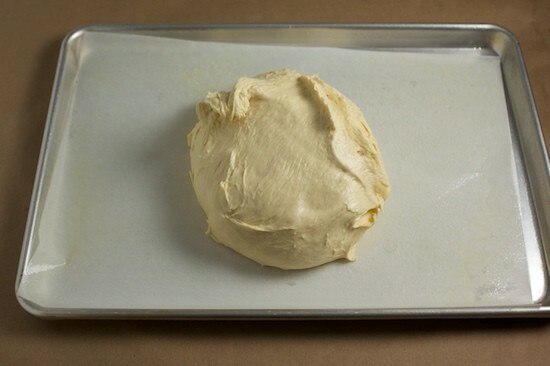 Next I lined a baking sheet with parchment, misted it with oil, and scraped out my blob of butter, er, brioche dough. Next I pushed it out into a rectangle before covering it with greased plastic wrap and putting it in the fridge for an overnight rest. 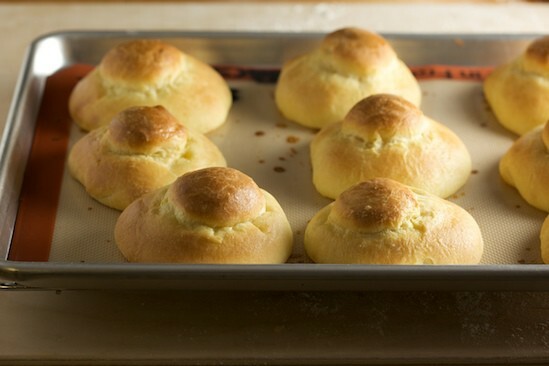 Since I don’t have any brioche molds, I decided to make brioche rolls like the ones I used to eat in Sicily. They have the little top knot, like the French petite brioche à tête, but are baked on a sheet instead of in the little fluted molds. I decided to divide the dough into three-ounce pieces for my rolls. And I shaped them using instructions found both in the book and this great video tutorial. I did my best to photograph the shaping technique, but the video will probably be more helpful. Before putting them in the oven, I brushed them lightly with an egg wash. 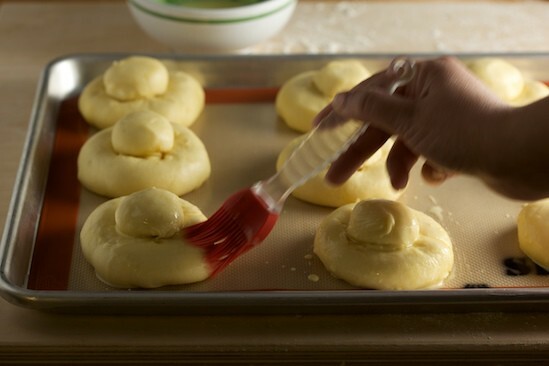 They were so soft and puffy that it was hard not to damage them with the pastry brush. I switched to the silicone brush halfway through because it was a bit more gentle than the natural bristle brush I started with. Finally they went into a 400-degree oven and baked until they were a beautiful and golden brown. I tried one while still slightly warm from the oven with a spoonful of raspberry jam. It was SO delicious! But these were by far the richest brioche I’ve ever tasted. They were so rich, it was actually difficult to finish an entire roll in one sitting, and I rarely have such problems! The next morning, I decided to make myself one of my favorite Sicilian breakfasts: granita and brioche! I had never made granita before, but I managed to create a slushy strawberry granita that reminded me a lot of what I used to eat in Catania. The granita in Catania is very slushy, not as grainy as most of the recipes I’ve seen here. So I processed my granita in an ice cream maker instead of using the ‘fork technique’ that I always read about. It was perfect and ready to eat after less than ten minutes in the ice cream maker. But I’ll write more about the granita in a different post. 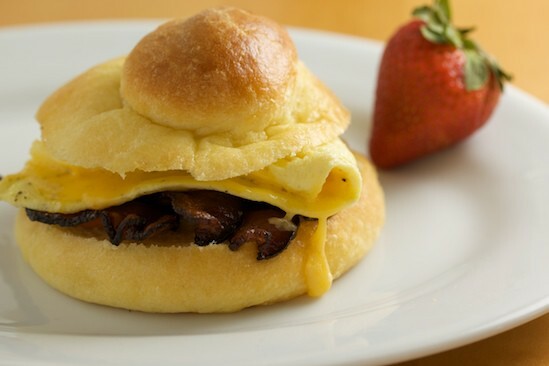 Want another breakfast idea for these brioche rolls? How about a Bacon, Egg and Cheese Sandwich? Ok, I admit that this was overkill since the brioche was already too rich. But it was SO GOOD! Next time I make brioche, I’ll do the Poor Man’s Version so that I can eat my breakfast sandwiches with a little less guilt. And what I haven’t told you yet is that I also made this delicious Cinnamon Swirl Loaf from a portion of the brioche dough. The recipe yields almost three pounds of dough, so I was able to make one Cinnamon Swirl Loaf in addition to all those mini brioches. 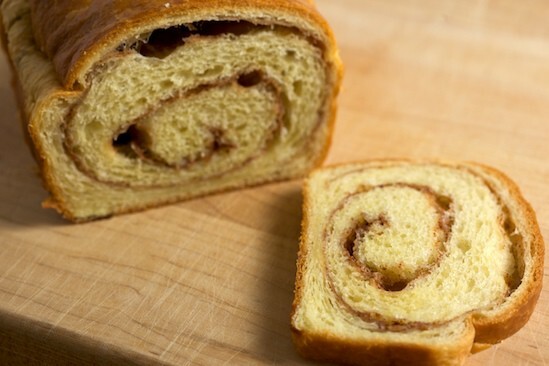 If you want to know how made the Cinnamon Swirl Loaf, feel free to check out the step-by-step photos on Flickr. Overall, I’m glad that I tried the Rich Man’s Brioche. It was a beautiful dough and the end result was delicious. But I really don’t think I’ll ever make this version again. It’s just too much. I can see myself saving even the Middle Class Brioche for special occasions, and baking the Poor Man’s version for hamburger buns and breakfast brioche. This week we will be making Casatiello. Peter Reinhart describes it as “…a rich, dreamy Italian elaboration of brioche, loaded with flavor bursts in the form of cheese and bits of meat, preferably salami.” Yes, please! Vegetarians feel free to substitute anything you want for the salami, or just leave it out entirely. Olives might be a fun substitution! Unlike the others we’ve made so far, this bread can be made in one day. The instructions begin on page 129 of The Bread Baker’s Apprentice. Good luck and happy baking! Deborah from Italian Food Forever is giving away a copy of The Bread Baker’s Apprentice! To enter, visit Italian Food Forever and leave a comment that relates to bread (talk about your favorite bread, a story about bread baking, etc). That’s it! You can enter as many times as you want until June 15. A winner will be chosen randomly. Good luck! 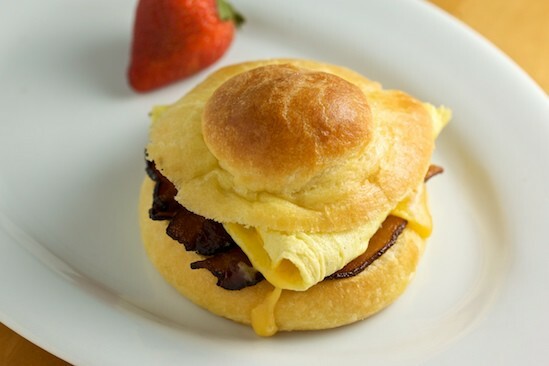 For those of you who are participating in The BBA Challenge, how did you like the brioche? Which version did you make? How did you shape it? Did you learn anything new while using this formula? And remember, if you wrote a blog post about Brioche, or have photos available online, please leave a comment and share your link! And finally I would like to say congratulations to Nico and his family, who just welcomed a brand new baby boy into this world. And if you can believe it, Nico still managed to write about his brioche from the hospital. Welcome, baby Tomas! I've been anxious to see your granita and brioche -- now that's a breakfast I can get behind :-) And the breakfast sandwich, yes please! Beautiful brioche! And I love that you found such great uses for all of it. It might be worth making another batch for that beautiful cinnamon-swirl bread. And I love your step-by-step photos. Thanks! Your brioche are beautiful! Thanks for linking to that video. It was an excellent demonstration. I will remember it next time I do them. Oh, wow. Yum. And thank you SO much for pointing out that one doesn't need brioche pans to make brioche! I've always avoided doing it because of no pans - now I have no excuse. I had the great good fortune to take an evening breadbaking class with Peter Reinhart a couple of years ago. What amazing fun! I'm glad I didn't know about your BBA challenge until after official signups had closed - I SO don't have time! - but I'm definitely enjoying reading about it. Brioche. Yes. Yum! Beautiful job! And nice write up, as always. My brioche gluttony (yes, I really did bake all three!) is at http://gaaarp.wordpress.com/2009/05/25/a-tale-of-two-brioches/. Wow Nicole, looks amazing! And you know how much I love BUTTER! Yum! What a pretty brioche, and the sandwich and granita look so wonderful. Thank you for the fun post! Oh my! 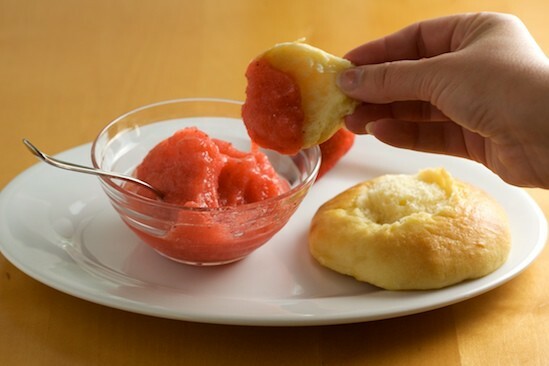 Granita and brioche- you just turned my little sheltered world upside down. I MUST try that sometime! Nicole, despite being Italian I never heard of the brioche con il tuppo that they eat in Sicily. Two Italian fellow bloggers mentioned to me after seeing my pictures. I have made brioche before, so the recipe was straight forward and probably the best I have made. I made the middle class since from experience I know that rich man has too much butter. Can't wait to try the Casatiello. Keep on baking! 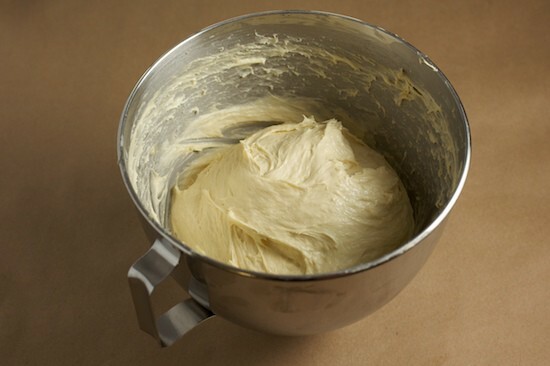 The dough does look like frosting!! Too bad it didn't taste like it though. 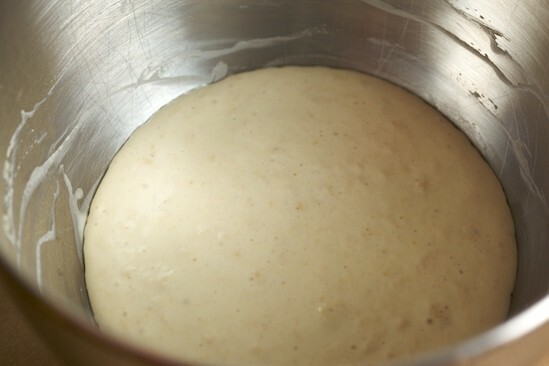 I think I would've been too scared to try raw dough, the yeast freaks me out! Your brioche looks very good. You need a huge pat on the back for leading & inspiring this wonderful group of bakers!! You're working so hard, and everyone seems so excited. Yay!! I'm infinitely jealous of the brioche. Especially the cinnamon swirl loaf. Would love to have tasted! What a scrumptious breakfast. I'm drooling in front of the screen of my computer. Wish I could get a smell-O-vision. Your brioche looks so rich and flakey and full of buttery goodness! Great job! Hi Nicole,beautiful brioche. 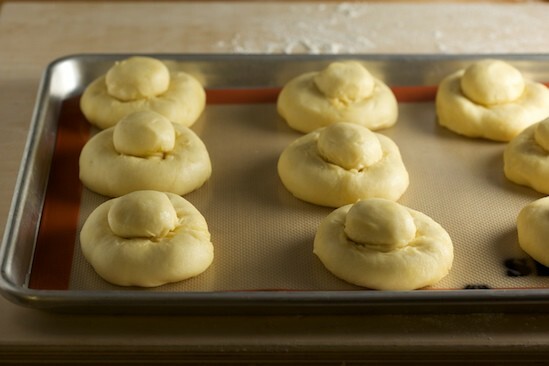 Thanks for the step by step directions for forming the brioche a tete. Your photos were way more instructive than PR's. The video was very great, I'm glad you provided the link. Wish I'd seen it before I formed mine. I did not realize how agressive you had to be in severing that little "head". I did not roll hard enough and I did not push it in, so it was lopsided. Your breakfast sandwich would make an Egg Mc Muffin blush with shame!! very nice as always. I was ready to go for the challa, I thought casatiello was a modification of brioche, I'm glad I read the post. I took last weekend off from the challenge because but not from baking since I made bagels again, they were as good as the first time. Wow - I love how your shaped your rolls. The Sicilian method it is, next time! I also enjoyed my first brioche with raspberry jam....and it certainly didn't disappoint! I have posted about the brioche on my blog here: http://haleysuzanne.wordpress.com/2009/06/08/bba-4-brioche/ and more pictures on Flickr here: http://www.flickr.com/photos/haleysuzanne/ Looking forward to seeing your casatiello! I just found your blog and I am really enjoying it! My fiancee loves to bake bread and he will be so excited to read this. If you ever make croissants, or already have, I want to know about it! 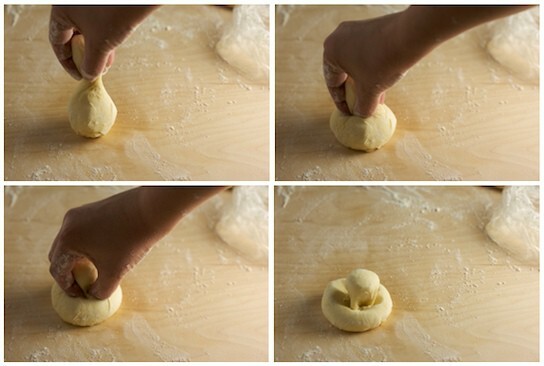 I really enjoyed the step by step coverage of your brioche baking. The pictures were so good, I wanted to reach right in and grab one. Thank you! 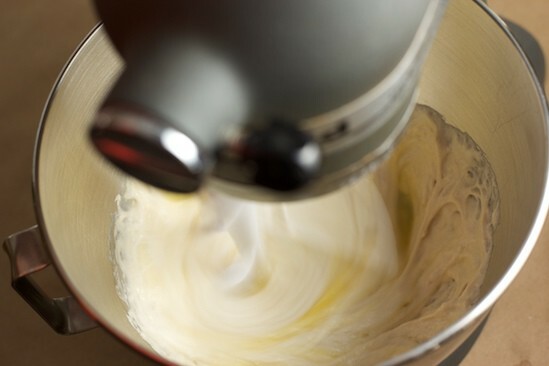 I have been wanting to make brioche but the recipe I have calls for kneading it the mixer for 30 minutes. Which would be fine, but my mixer has been making an ominous ker-thump ker-plump sound when I've been making bread lately. I've got a new mixer all picked out and bookmarked for the day that mine dies. Anywho, I have a feeling that mixing bread dough for 30 minutes would be the end of my poor little workhorse. So, my question was, about how long do you think you mixed it after you had to switch to the bread hook? 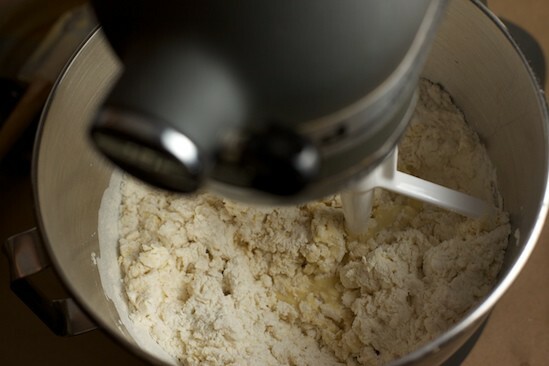 Jennie: It was mixed/kneaded for less than ten minutes (other than mixing in the butter) and it was all on low speed. 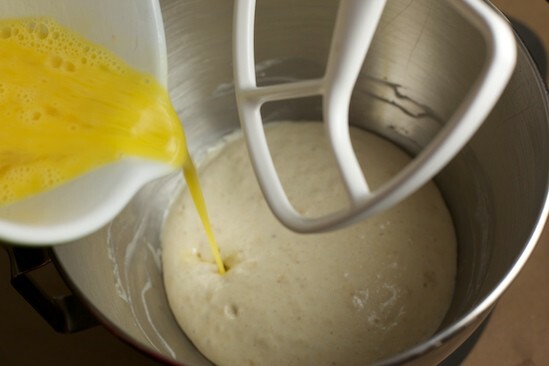 The instructions were to let the dough rest for five minutes to develop gluten instead of extra kneading before adding the butter. After adding the butter, I think I mixed for an additional 6-7 minutes. I loved making the Brioche. I made an Almond Filled Ring - http://peteeatemall.blogspot.com/2009/06/let-them-eat-almond-filled-brioche.html and left with my Mom. It was yummy...your little ones look so rich and cute...I have always filled brioche with something ...cinnamon rolls, almonds...I need to try just as is...looks great! Thanks for sharing! Happy Baking. It really is out of sight rich! Beautiful Brioche Nicole!! Bacon, egg and cheese on brioche?! Yes, please. Yours look great. The rolls are adorable, but that cinnamon bread is really calling my name! Wow, everything looks fantastic, Nicole! The granita sounds really yummy, too. My post won't be up until later in the week--I'm just using the second half of my dough this morning. Your brioche turned out beautiful! I thought the little top hat was so cute. And the cinnamon swirl loaf looks delicious. Okay, I think I'm going to have to break down and get the book. Hmm....Yummy. This food is very delicious, thanks for share. great picture.I love it. I'll wait you on my blog also. 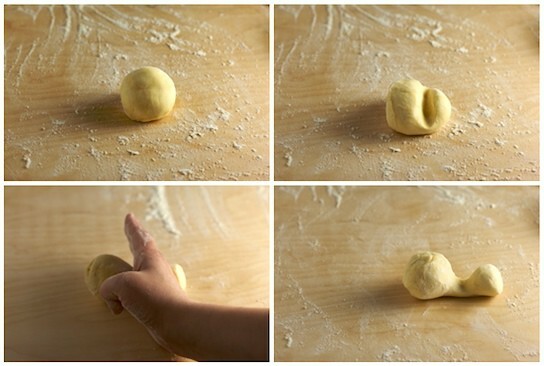 I never thought about switching to the dough hook. I had the climbing problem and found myself playing gatekeeper with a spatula. I will glady take one of those bacon egg and cheese brioches too! That buttery dough almost seems too rich. Looks impossible to do by hand, which is a good thing in my case. Wow! sounds delicious....brilliant photo story. I'm loving your detailed posts as you work through the recipes. 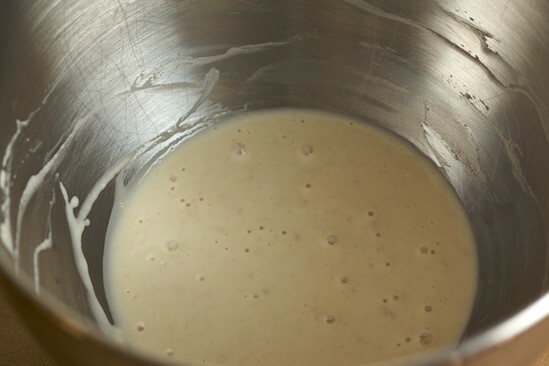 I'm finally making the rich brioche this weekend so thanks for all the "play-by" here. Gorgeous photos as always, too. Mine were not the resounding success that yours were. http://food.laurieashton.com/2009/06/peter-reinharts-poor-mans-brioche-sourdough-version/ I made the poor man's version with sourdough and it failed. Nobody liked it. I ended up putting it into bread pudding with copious amounts of sugar to save it, and happily, that worked. I'm convinced it's me, not the recipe. Your brioches à tête look soooo cute! I made the poor man's version and wouldn't do it again unless I wanted plain white German bread. Next time I'll go for the middle-class brioche and make them in Brioche pans. Here's my post: http://ap269.wordpress.com/2009/08/23/bba-challenge-4-brioche/. Your Brioches look so good...great pictures! I made the middle class and made some brioches à tête and one bigger one. They turned out really well. I'm running through BBA at a slightly faster pace because I want to be able to make and re-make the recipes with ease in the future. I just made the dough for the Middle-Class Brioche and was wondering how to form them without brioche molds. I want to be able to give some away for critique. I think I'll use a muffin tin so they have a bit more pan-crust, and I'll definitely try the shaping technique from the video. Oh my sweet lord... I love this post. My petite brioche a tete are rising right now (middle class for me). And it's literally perfect timing for me to read this post, because they've risen for a little over an hour, and now I know not to let them go for the full two hours. God bless you for doing the rich man's brioche (life is short!) and thank you for all the glorious pictures. I was trying to figure out the shaping technique from the book, but with only two pictures I wasn't quite getting it. And if I haven't gushed enough - that breakfast looks AMAZING... I hadn't thought of making a sandwich out of my brioche, only ever had it with a bit of jam, or you know, just plain. 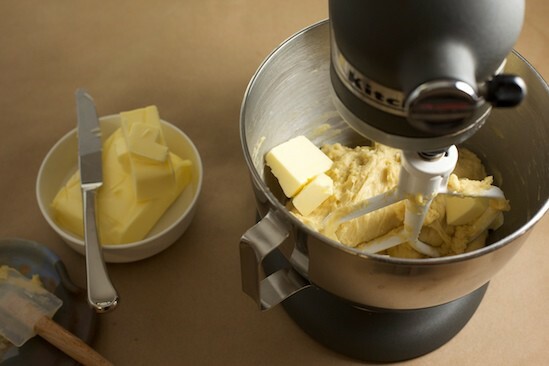 Oh... and re: adding butter by hand, I did it *once* and the very next day I marched out to the store and bought my Kitchen Aid mixer! LOL. The Middle Class Brioche calls for a more moderate amount of butter, while the Poor Man’s Brioche almost seems healthy after reading the butter content of the other two. Just did this to offer in a Xmas gift basket with some of my home-made lemon-marmelade. I did every step in "old-fashion", using only a spatula, a whisk, and my own two bare hands. Being a 30y.o. dad of three, pharmacist, cyclist, hipster....my life is already very fun... but working this dough bare-handed was the most fun I had in a while!!!! As I'm writing this, the dough is resting in the fridge overnight, and I'll bake it tomorrow. I plan on doing 2 braided loafs... can't wait. I know somebody who's gonna have a nice breakfast on Dec26th!!! After checking out a handful of the blog articles on your blog, I seriously like your technique of blogging. I saved it to my bookmark webpage list and will be checking back soon. Please visit my web site too and let me know what you think. Is there a recipe for this? I want to make these...maybe I'm blind haha, but I can't find it!